once the weather started to cool down, and most tourists had quit the city, i decided that it was time to bring out the bicycle. i love riding my bike, but find it very stressful when there are too many people around me. it’s still quite busy in the mornings getting to work, but i try to be calm and not get angry with all cyclists and pedestrians breaking the traffic rules. i just try to enjoy the beautiful autumn mornings. even though cycling warms you up, it can leave your hands quite cold and due to my lack of gloves, i’ve had to borrow the ones i made for my boyfriend last winter. since they’re too big for me, i happily cast on for a new pair. 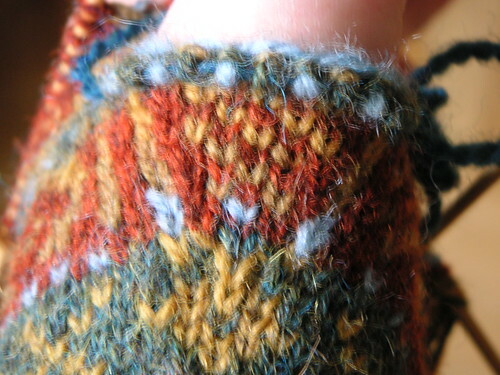 the pattern comes from carol rasmussen noble’s book knitting fair isle mittens and gloves, same as used last time. i thinkshe calls the pattern forest cross or something similar (have to check, i’ll get back to you on this. edit: i checked and the name is forest cross). well, since i’m using very autumnal colours i’ve decided to call mine autumn forest. 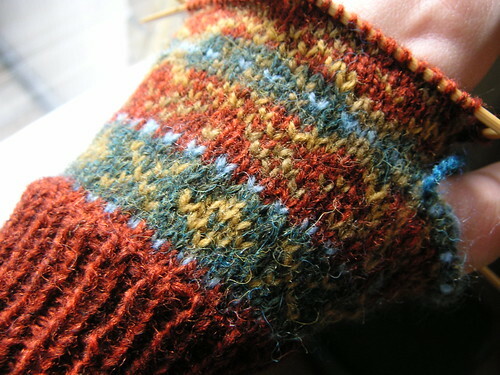 i have made one, not very big, but significant modification: i’ve added a thumb gusset. some of the patterns in the book have them, others don’t. this one didn’t originally, but i compared the available ones and found one that i thought would look nicest. of course in that particular pattern they’d forgotten to add the thumb gusset chart! 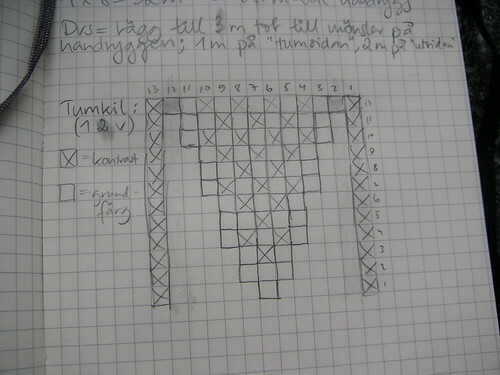 so with some calculations (it wasn’t that hard) i drew my own chart. i think it turned out quite nice. as soon as there is even a hint of autumn in the air i seem to get the urge to knit a scarf. autumn came early to stockholm this year. 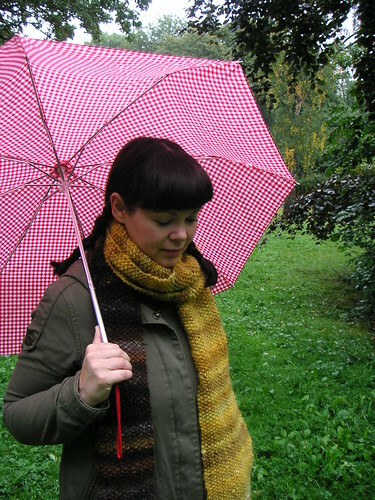 i bought three hanks of yarn in the most wonderful autumn colours when i was in dalarna. i already had a scarf in mind when i bought them, and i did start knitting with them immediately. i unraveled it a couple of times to change the gauge or the amount of stitches, but i knew right away i wanted a moss stitched scarf, and this yarn is just perfect for moss stitch. i realized i have made a new scarf every year since i started knitting in 2004. i just can’t get enough of scarves. i don’t know how to wear shawls, but scarves are different. i have loads.